Heading north from Mekele we drove further into the Tigray region which, along with Eritrea, is regarded as the cradle of Ethiopian Orthodox Christianity. 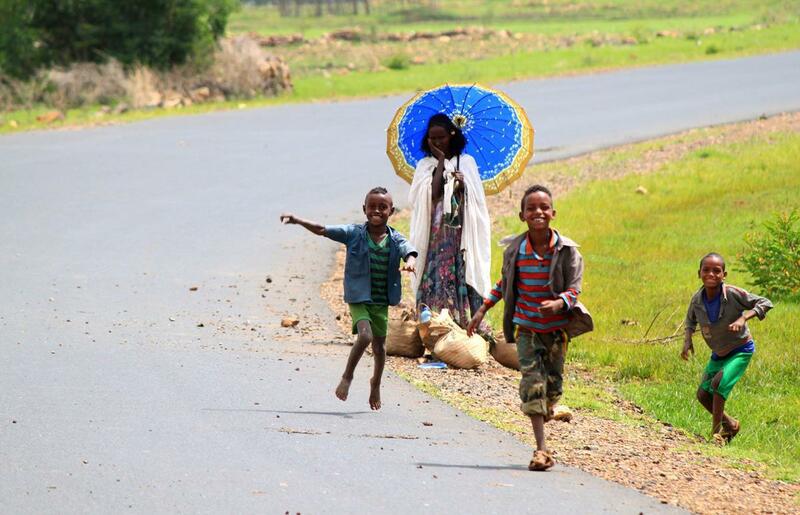 A women in typical Tigray wear. We were again treated to quaint, orderly countryside views of terraced hillsides and houses and their surrounding walls, often perched on hilltops, built up from rectangular blocks of yellow sandstone. Passing through some orderly countryside. 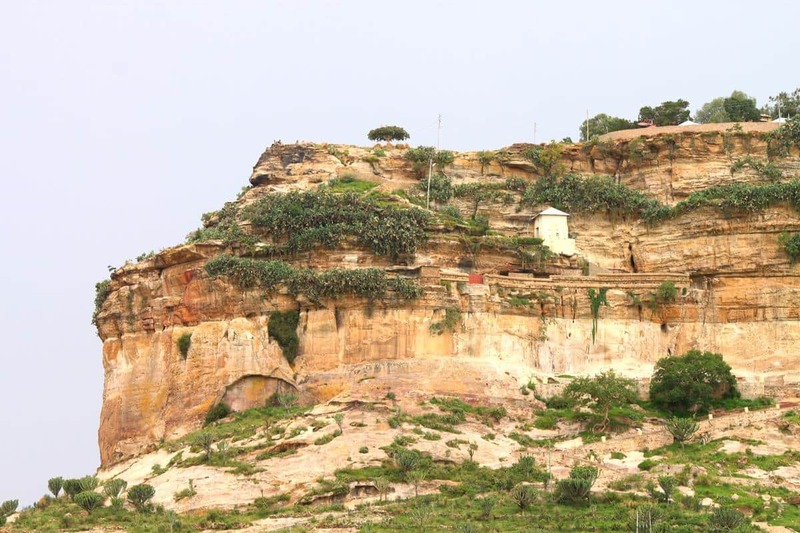 A surprising number of churches have been built in elevated positions and a large white place of worship, built high up on a cliff, makes a particular impression on entering Adigrat. The impressive church as you enter Adigrat. 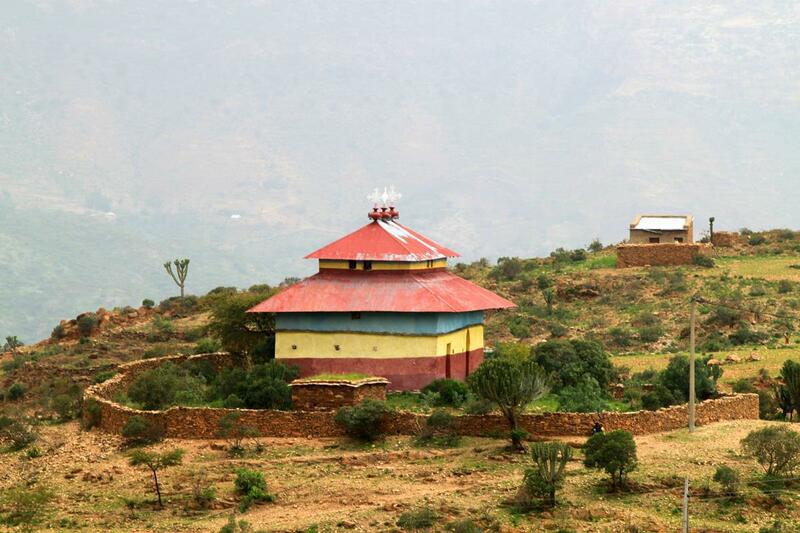 Adigrat is known for its rock hewn churches high up in the surrounding red sandstone mountains. After having paid 50 USD per person (plus 500 Birr for a guide) to visit the Lalibela churches we decided not to explore the Adigrat churches. We have heard from fellow travellers that the informal want-to-be guides hassle tourists until they hire them and then one has to pay the priests on top of that to visit the churches. 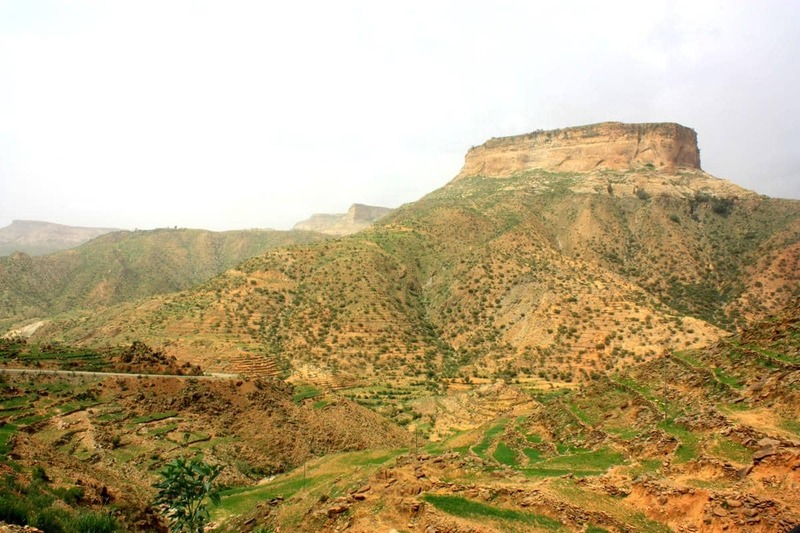 This town lies below some very high ground and the road west towards Axum immediately wound its way upwards offering spectacular views. At Mujulat we passed through the Hista River Gorge which affords impressive views of red cliffs and green terraces. The impressive Hista River Gorge. We were fortunate to fit in a dry lunch stop, where after the dark clouds that had threatened, released their load as we descended the pass. We were happy to drive through the storm so that the accumulation of mud and particularly salt of the Danakil area could wash off the undercarriage. 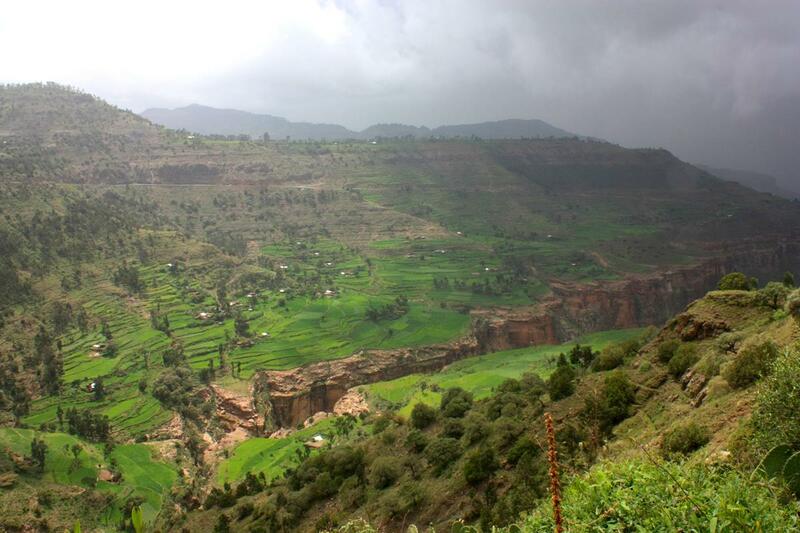 Having little option but to visit Ethiopia during its wet season, we were concerned at the impact this would have. However, we’ve learnt that most of the rain falls in torrents in the later afternoon, often accompanied by wind, lightning and thunder. On high ground the mist can roll in early and obscure views and the absence of sunlight can make it chilly. We took a detour to see the Debre Damo monastery and its 6th Century Axumite stone church, built at an altitude of 3000m on a flat topped hill surrounded by impregnable cliffs. So inaccessible are the mountain top buildings that they are barely visible from the road below and, being only partially informed, we mistook the modest guard house situated half way up the mountain and at the top of 15m cliffs (which visitors have to scale with the aid of rope) as being the main item of interest. 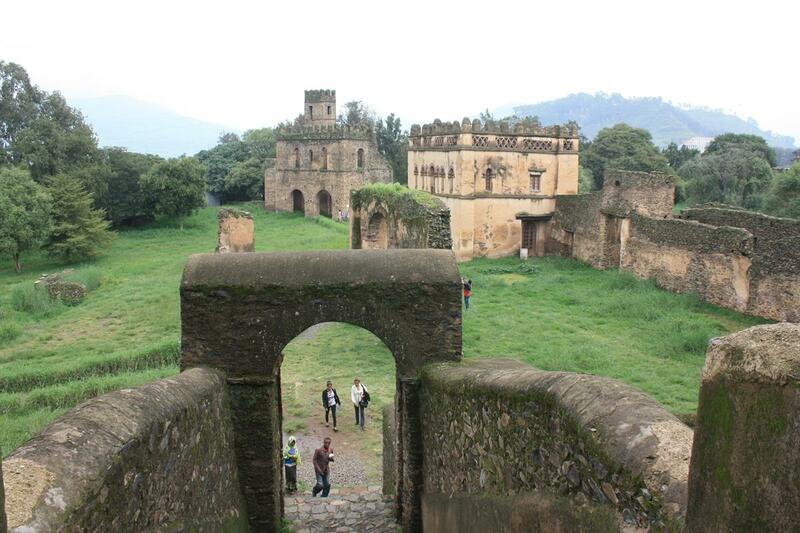 We mistook the white little building for the Debre Damo Monastery. Disappointed, we drove away wondering what all the hype was about. Reading that only males are permitted to ascend, that is if one’s faith satisfies the inquisition by the local priest, and not having time, we had a good laugh at our mistake and drove on. 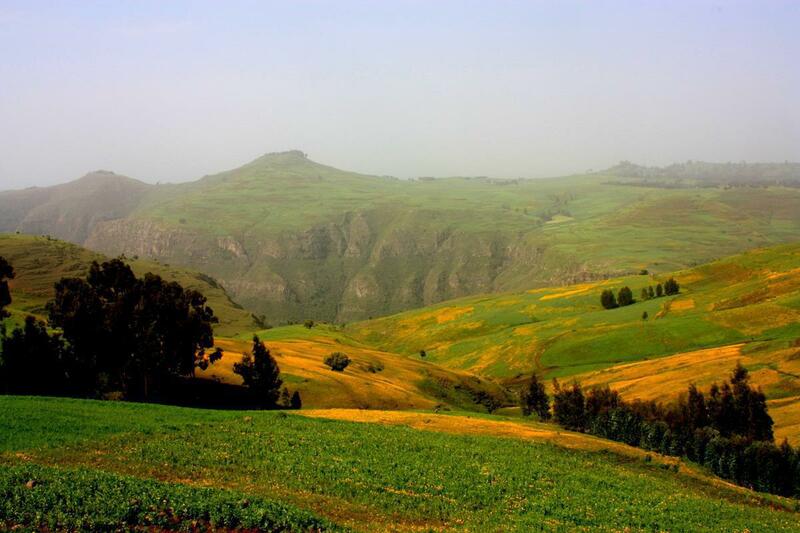 More dramatic landscape on the way to Axum. 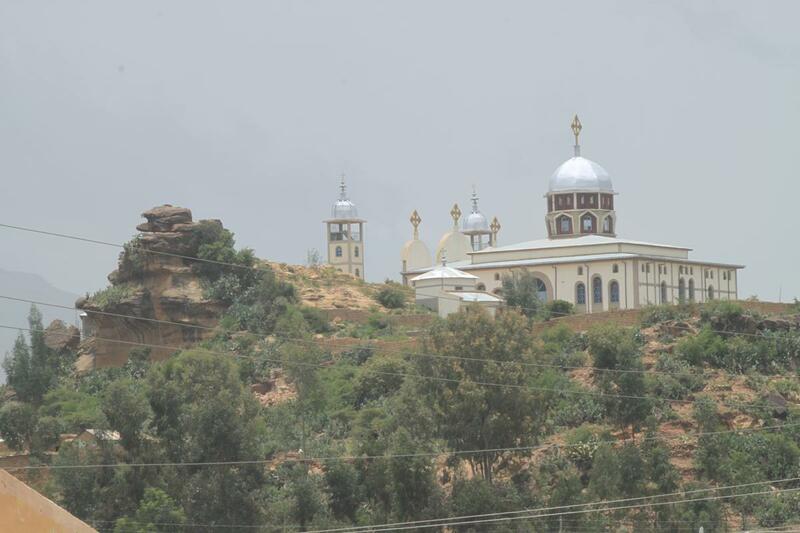 As we approached Axum, the most northerly point on our travels, since we decided not to brave the 50 degree Celsius plus temperatures of the Sudan, we were repeatedly reminded that this area is a Christian stronghold and were astounded by the number of churches. Most of them square, colourful with brightly painted roofs, some crowned with three crosses. One of the hundreds of churches built high on a hilltop. After the natural wonders of the Danakil we didn’t feel inclined towards sightseeing in Axum, regardless of the fact that it was an ancient city, established three centuries before the birth of Christ, the technologically advanced centre of the mighty Axumite Empire and major participant in world trade between the 1st and 7th centuries AD. 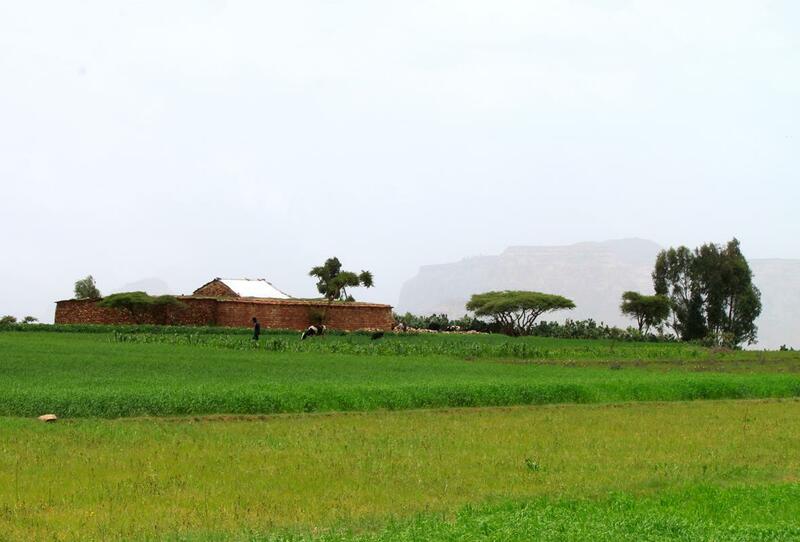 As Axum was partially destroyed by the Muslim leader Ahmen Gragn in the 16th century, much of it is no longer visible, its history yet to be fully established through archaeological excavation. The tiny fraction that has been done indicates that a wealth of information has yet to be uncovered. The stelae field is one exception to this and these obelisk-like structures were visible from our hotel. It’s believed, but without scientific basis, that each stele, some up to around 25m high, can be attributed to the personal commemorative desires of ancient Axumite kings, who had them built as a site for their tombs. 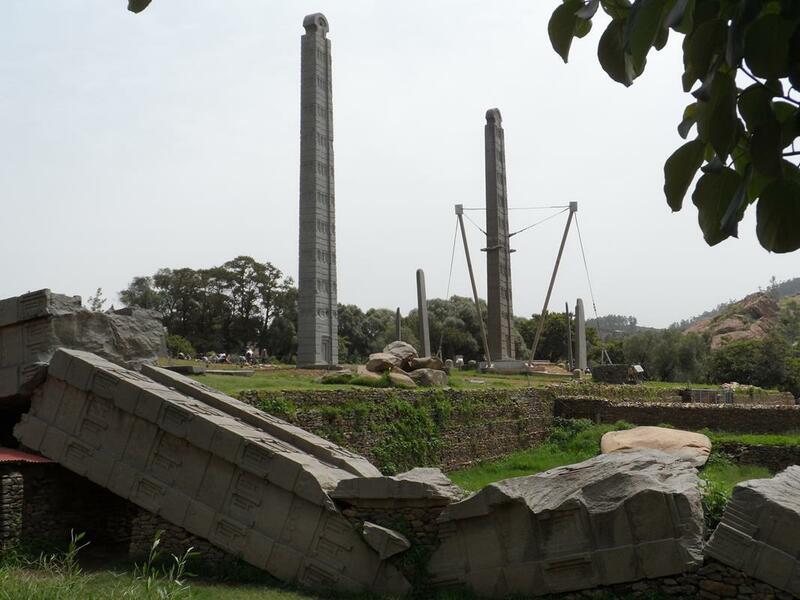 The 3rd largest of these was cut into three pieces at the time of the Italian occupation and reassembled in the piazza in Rome, but, after negotiations between the two governments, was returned to Axum in 2005. In Debark we decided against camping in the park at around 4000m due to the likelihood of rain, so purchased a day entry permit. An armed scout is obligatory and whilst the parks office strongly recommends a guide as well, we declined since we weren’t going trekking. Driving in we passed soft rounded hills, clothed in green with large patches of bright yellow flowers. We were astounded by the soft, rolling hills covered with patches of yellow flowers. Once in the park we saw troops of gelada monkeys, many with young, and colourful flowers and herbs such as thyme and fennel. 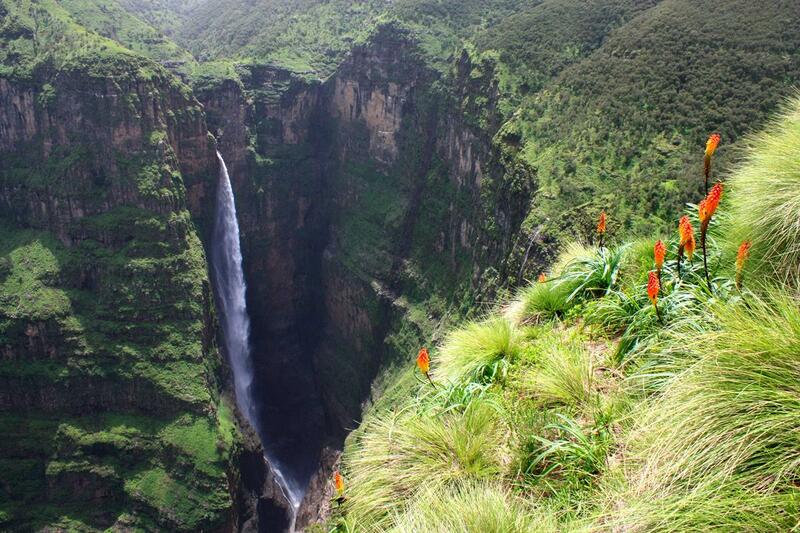 A short walk took us to the impressive Ginbar waterfall, with its 500m drop in full mass with all the rain. 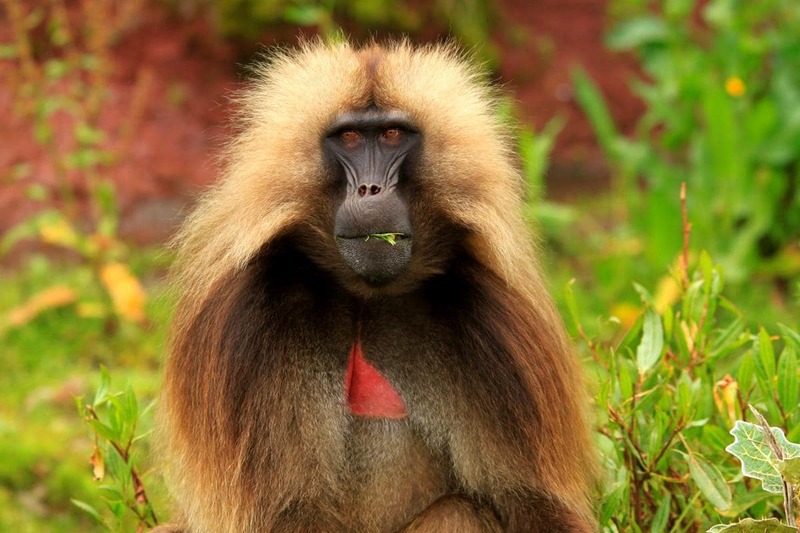 A colourful male gelada monkey. We were disappointed to see the extent of agriculture (mainly barley) as we continued deeper into the park, concluding that land tenure pre-dated the proclamation of this area as a National Park. Indeed there were more donkeys, horses, sheep and cattle than wild animals. Stopping for lunch at a point close to a steep cliff we watched a large group of vultures riding the up draught from the valley many hundreds of metres below. These birds were clustered on a tree some way down and periodically would launch themselves and swoop down before catching the upward current of air. Then they would rise rapidly to soar above us. Some reached the peak of their ascent, then tucked in their wings, plummeting like falcons. Birds of prey soaring on the thermals. Several birds carrying scraps of food were chased by others, locking talons and tumbling through the sky, often the food falling from their grasp, only to be snatched up by the quickest. 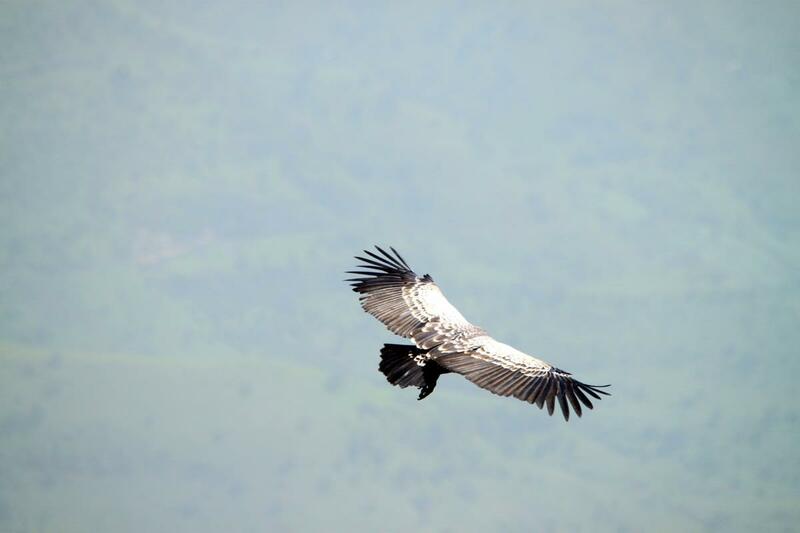 Once they tired of their acrobatics, they would fan their wings, extend their legs and talons to act as air brakes, and spiral down to their perches. We were told that there are only about a hundred Ethiopian wolves in the park and they and the endemic Ibex are only seen on the highest slopes. The park is beautiful, named after its sharp peaks, but one should not expect an untouched area as people live and farm there, occupying all of the arable land that we saw. To be fair however, only a hike away from the road would truly do justice to the views, which their dramatic drops to the deep valleys below. 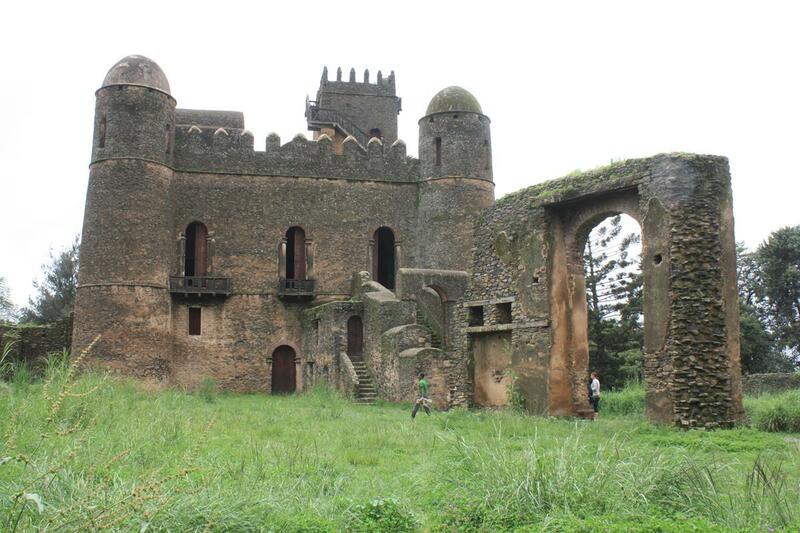 Founded in 1635, Gondar served as the capital of the country for 250 years. Today it is a bustling, large, modern town by Ethiopian standards, with many people, sheep, goats, donkeys and cattle wandering in the streets. These, along with the main form of transport, capable little tuk-tuks (called Bajaji’s) and horse carts, make for attentive driving. The castles, built by various kings in the 17th century in a walled area on a hill in the centre of the town must rank as some of the best in Africa. The castle complex with various castles. One of the impressive castles. Needing a break from more or less constant driving since we entered Ethiopia, we camped at Tim and Kim Village (a lodge and campsite) on the northern shores of Lake Tana. This was the first properly established campsite we had seen in Ethiopia, run by a Dutch couple, with immaculate ablutions, in spite of the lack of hot water in the showers. After the non stop loud blaring of church loudspeakers in Gonder the whole day and sometimes even in the middle of the night, it was bliss to wake up to the soft sound of the nearby stream flowing into the lake and the melodies of the prolific birdlife. 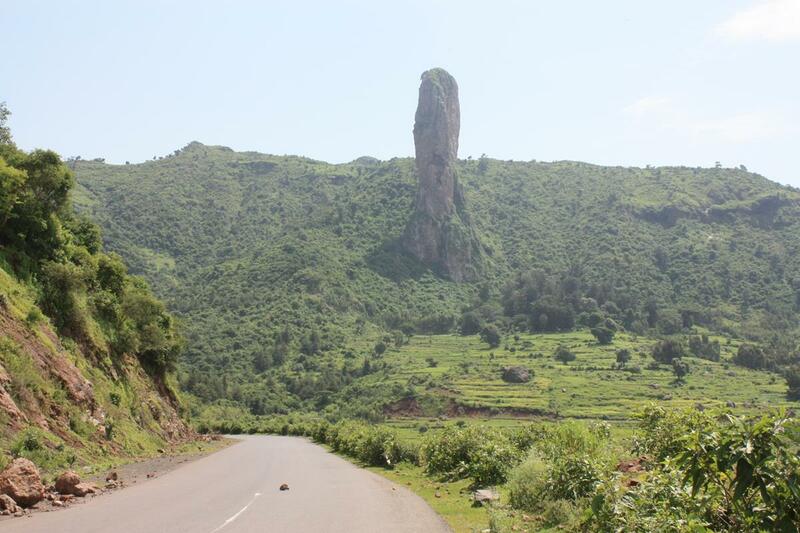 An interesting rock formation as we headed for Bahir Dar. 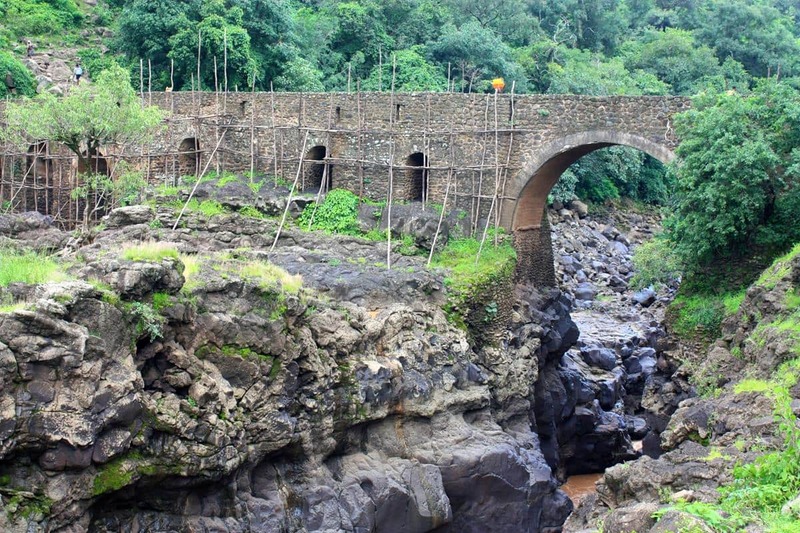 We headed for Bahir Dar at the south end of the lake to see the Blue Niles Falls. The Blue Nile River joins the White Nile at Khartoum in the Sudan to form the Nile. The road out was bad gravel with back-to-back dirty villages, people and livestock. We hoped to bush camp at the falls but as soon as we reached the so-called, but non-existent parking area, we realised that it would be impossible. 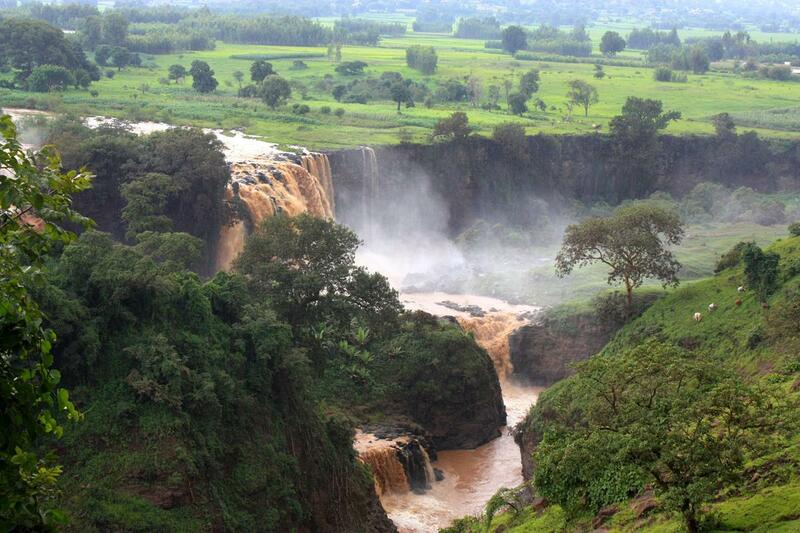 Mist hanging above the Blue Nile Falls. The beautiful old Portuguese bridge. Reaching the falls involved a 30 minute hike, crossing a beautiful old Portuguese bridge en-route. The 45m high waterfall was muddy brown after all the rain and wasn’t nearly as spectacular as the Awash Falls or as beautiful as the Ginbar in the Simien Mountains. Wishing to press on south, we cursed at a puncture on the way back in the rain. A sharp rectangular piece of rock, about the thickness of a finger, penetrated one of our new Bridgestone MT tyres, necessitating a very muddy change. In the process we ruined our screw jack and the harassment from a large, noisy, pressing crowd didn’t make things any easier. 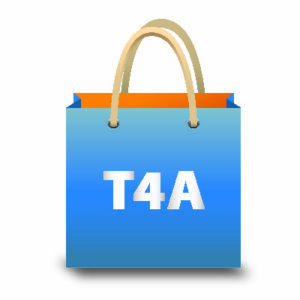 On return to Bahir Dar it was 7pm and, realising it was Saturday evening, we quickly shopped for a replacement jack. The next morning we had the tyre fixed by having a rough patch glued on and a tube put in, as the hole was far too large to be plugged. This brought the number of badly damaged tyres to four – all on the rear. So nicely written and what a beautiful and interesting landscape. You are very brave and privileged to experience it. Great stories and fantasic photographs! Karin, changing the tyre, we had about 42 looking the way we were making supper in a fine drizzle. we missed the Dutch couple as they were on leave. as you mentioned a very nice camp site. met a SA man and his wife that paid him a visit from Pretoria. 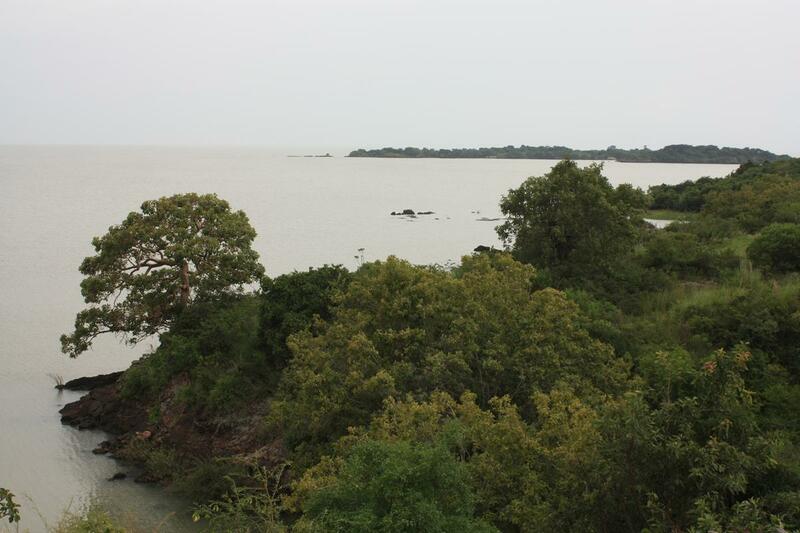 he was working with the government and the Chinese with mass plantation taking water from lake tana.